Defense Support of Civil Authorities (DSCA) is support provided by federal military forces, DOD civilians, DOD contract personnel, DOD component assets, and NG forces (when the Secretary of Defense [SecDef], in coordination with the governors of the affected states, elects and requests to use those forces in Title 32, USC, status or when federalized) in response to a request for assistance (RFA) from civil authorities for domestic emergencies, law enforcement support, and other domestic activities, or from qualifying entities for special events. DSCA includes support to prepare, prevent, protect, respond, and recover from domestic incidents including terrorist attacks, major disasters, both natural and man-made, and planned domestic special events. DSCA is provided in response to requests from civil authorities and upon approval from appropriate authorities. By definition, DSCA operations are conducted only in the US homeland. The US homeland is the physical region that includes the continental United States (CONUS), Alaska, Hawaii, United States territories, and surrounding territorial waters and airspace. 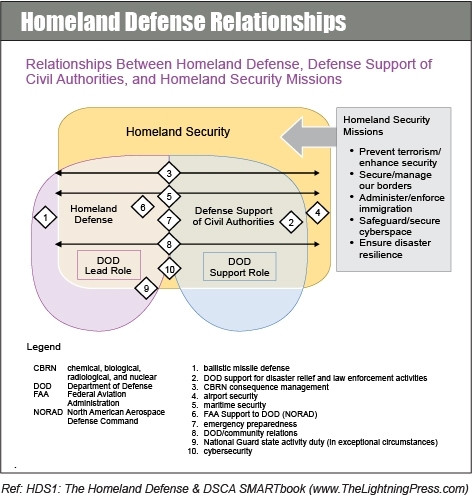 The Armed Forces of the United States and Department of Defense (DOD) agencies may be called upon for defense support of civil authorities (DSCA) to support a whole-of-government response in support of civil authorities, although not specifically organized, trained, or equipped for the support of civil authorities. The US Armed Forces have a historic precedent and enduring role in supporting civil authorities during times of emergency, and this role is codified in national defense strategy as a primary mission of DOD. The nature of DSCA in the US presents a unique challenge based on the history of the country and the interaction of the federal, state, local, territorial, and tribal governments and private and nonprofit organizations. These relationships establish the multiple layers and mutually reinforcing structures throughout the state and territorial governments for interaction based on the US Constitution, as well as common law and traditional relationships. Federal law, as codified in Title 10 and Title 32, United States Code (USC), creates distinct mechanisms for both local and state authorities to call upon National Guard (NG) forces or resources. Federal forces, both active and reserve, may also be requested if necessary under Title 10, USC, authority. The United States Coast Guard (USCG) is a unique force that carries out an array of civil and military responsibilities touching almost every facet of the US maritime domain. The USCG functions as a part of the Department of Homeland Security (DHS) under Title 14, USC, which includes law enforcement roles and missions. The USCG may be transferred, in part or whole, to the Department of the Navy when war is declared by Congress or as directed by the President. The NG of the United States is administered by the National Guard Bureau (NGB), which is a joint activity under DOD and provides a communication channel for NG to DOD in order to support unified action. This framework establishes the mechanisms for seamless coordination among federal, state, territorial, tribal, and local governments to prevent, protect against, and respond to threats and natural disasters. NG forces operate under state active duty, Title 32, USC, or federal active duty, Title 10, USC, depending on activation status. Homeland Defense (HD), DSCA, and homeland security (HS) operations or events may occur simultaneously. Perhaps one of the greatest challenges for a military staff is operating in or near the homeland and being subject to the inherent legal and jurisdictional responsibilities that accompany such operations. This challenge is set against the evolving range of threats to the homeland–to countering transnational organizations and individual actors of concern internal and external to the US. HD and DSCA missions missions can be conducted in a simultaneous, near-simultaneous, or sequential fashion, across the threat spectrum, within or near the homeland. A full range of threats and hazards confronts the homeland. Many threats may not require a DOD-led response, and may not require a response from more than one civilian department or agency. The characterization of a particular threat, and the designated response agencies and modes, ultimately rests with the President. To prepare for wide-ranging contingencies, the USG has developed specific protocols and response options that address the coordination, integration, and responsibilities of the federal agencies to respond to the full spectrum of threats and hazards. Codification of these strategies, processes, and procedures is found in documents such as the National Strategy for Maritime Security and US Aviation Security Policy, and their respective supporting plans. These types of processes aid both the military and civil authorities to identify which agency or agencies are best suited to achieve the USG’s desired outcome given the unique circumstances of the event.